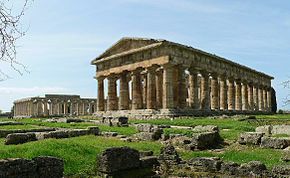 Paestum is a Greek settlement where you can find the best preserved Greek doric temples worldwide. Most of the ancient Greek city has not been excavated yet. Besides three temples, the side has a gymnasium, city wall and tower ruins and plenty of house wall ruins. Part of the site is also a museum showing excavated items such as statues, vases, metalwork, and painted grave stones. This article uses material from UNESCO World Heritage List article "Paestum", which is released under the Creative Commons Attribution-Share-Alike 3.0 IGO License.